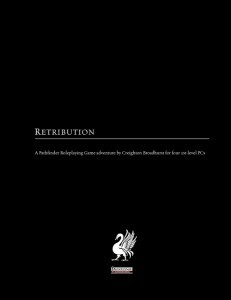 Retribution is a 71 pg pdf, 1 front cover, 1 blank page (inside the front cover), 3 pages credits, half a page SRD, 1 page ads and 1 page back cover. The module Retribution is extensively bookmarked for ease of reference; all the statblocks also have flavor-text describing the monsters/enemies as well as summaries of the obtainable treasure at the end of each part, making the adventure very easy and comfortable on the DM. Part I: Sanctuary (8 pages) – Retribution starts off with a journey through a snow/sleet storm towards the Priory of Cymer that perfectly captures a foreboding, gritty and harsh atmosphere of the adventure and sets the mood for the rest: The tone is one of an old, uncaring world that is not too far from the past of our own in terms of the dangers of traveling. The 2 encounters on the road are very good examples for the fact that environment, circumstances and the like may make for very interesting encounters, even on first level. There are also some hooks suggested to start the adventure, one of which assumes that some of the PCs are sick and go to Cymer to get healed. That’s an unconventional hook that actually worked very well for my group and further set the gritty mood– Excellent idea. The wilderness-journey part of the adventure ends when the PCs arrive at the Priory of Cymer. Part II: Signs (31 pages) – The next part of Retribution is a roleplaying-heavy/investigation-section, something I’d love to see more often, especially due to the fact that the atmosphere is constantly building up. From the beginning and the introduction of the NPCs, the first thing that springs to mind as an analogue to the atmosphere is Name of the Rose. The atmosphere is simply superb and one of the most dreaded role-playing encounters, the dinner with several NPCs, has been presented in a way that makes the conversations flow naturally and with ease as several sentences and talks are presented for the DM. Furthermore, the text is interspersed with troubleshooting advice, columns on the reaction of NPCs to some of the ominous happenings in the next couple of days and ends in an exciting series of encounters that serves to further underline the established gritty and ominous atmosphere. The climax sees the PCs undertake a kind of skill-challenge and roleplay their way past a potentially dangerous being. Part III: Darkness (12 pages) – The final part of Retribution is a descent into darkness, both physically into a dungeon and symbolic, into the tarnished soul of the primary antagonist: It includes a chasm and a tidal surge, mirroring the emotions of the antagonist in the obstacles and enemies the PCs will have to face until they reach a furious showdown and triumph in battle, slaying the villain. No, wait. They can actually talk sense into the villain in the final confrontation, save his soul and solve the encounter by role-playing instead of roll-playing! In my humble opinion, a showdown of a diplomatic skill-challenge, a heated discussion can evoke even more suspense than a frenetic battle (Plus, the PCs had enough of that already!). Thus ends the adventure section of Retribution with all the NPC-destinies results of the PCs blunders or victories. The second appendix is 8 pages long and focuses on the folk of Cymer, presented in the detailed manner we’ve come to expect of Raging Swan Press: That means they all have their own b/w character portrait, own distinct mannerisms and distinguishing features that help the DM to make them memorable. Each of them comes with an additional hook to draw the PCs into the adventure, centered on the NPC, making the adventure easier to individualize to your PCs. The pdf closes with appendix 3 and new rule items (4 pages), to be precise the half-goblin race, a new magic item (the Blessed Aspergillum, which has its own picture and even a whole print-out page in the look-see art web-enhancement) and information about the 2 default gods used in the adventure as well as a sect. First is that there is no player-friendly map of the dungeon. I like to cut up printed maps and present them to players while they are exploring. My second gripe is something more severe, though: The maps of this adventure feature my arch-nemesis, the bane of my existence: Letters on maps. I hate them with a passion. I realize they are necessary for the DM-maps. But why do they have to be in player’s maps? So they can see all significant locations and walk from A to B to C? So they can be reminded that this is a game with hotspots and get ripped from the awesome mood of the adventure? I just don’t get why maps bare of letters and numbers to hand out to your players are so rare. Usually, that alone would suffice for me to deduct one star. Retribution ranks among the best first level adventures I’ve ever read. It’s not over the top, it’s personal. And it’s better off for it. Check it out. It’s vastly superior to almost any first level adventure I’ve read for PFRPG.